Joslin Diabetes Center, Boston, USA Melinda Maryniuk, MEd, RD, CDE, FADA Director, Clinical Education Programs, Strategic Initiatives Joslin Diabetes Center Boston, Massachusetts As Director of Clinical Education Programs for Strategic Initiatives at the Joslin Diabetes Center in Boston, Massachusetts, Ms. Maryniuk oversees the clinical, educational and quality improvement activities for the 40 Joslin Affiliates. She also coordinates the education activities for the HealthCare Services Department, including several national diabetes education initiatives. Her areas of special interest include nutrition, patient education, behavior change, and increasing access to quality diabetes education services. Ms Maryniuk has worked in the field of diabetes education for over 30 years and has lectured and published extensively for both patient and professional audiences around the country and internationally. 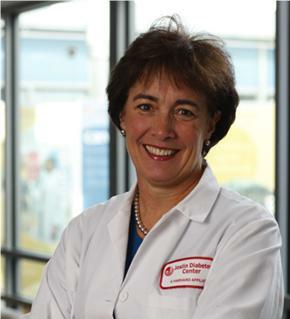 She is active within the American Diabetes Association, having served on the Board of Directors, as chair of the Education Recognition Program Committee and is currently an Associate Editor for Clinical Diabetes. Within the American Dietetic Association, Ms. Maryniuk served as Chair of the Diabetes Care and Education Practice Group as well as Chair of the Division of Clinical Dietetics and Research of the Council on Practice. She is the recipient of the 2005 Outstanding Educator in Diabetes from the American Diabetes Association as well as the 2010 Medallion Award from the American Dietetic Association. She recently served as a Co-Chair for the task force to review and revise the National Standards for Diabetes Self-Management Education. Melinda has a BS from the University of Tennessee-Knoxville and a MEd from Tufts University. She completed a dietetic internship at the Frances Stern Nutrition Center in Boston.